I was looking for more applications for the tissue paper texture technique I described in my last post.....thinking about what the texture reminded me of,..... when I thought tree bark. So here is the result. Please click on the picture for a close up view. Now you could easily vary the background and do it in a variety of mediums...pastel, colored pencil, colored paper collage..etc. Prepare a tissue textured piece of watercolor paper following the directions in the previous post. Turn over and draw some tree trunk shapes in pencil running down the length of the paper. Now Aspen trunks tend to be narrow and fairly straight...no big curves. Take a piece of watercolor paper for your background and tape off. Add a few pieces of tape to your tree trunk....this is just temporary so you can trace in where the trunk will be. Don't worry if the trunk is too long for your paper we'll deal with that. Using pencil lightly trace where you have put your trunk...before you lift it off the paper....mark cutting lines at the top and bottom of the trunk. Trim to fit. Also mark on the back of the tree its location and put a corresponding mark on the background. This makes it easier later on when you're gluing the trunks on the background. Try to make a nice placement without them looking perfectly lined up....I placed them a little off kilter. While the sky is drying I painted in my foreground...paint right over where the trees are going in. I also added some mask at this time..I wanted some aspen trees in the distance so I masked out some fine lines for the trunks. While the background and mask is drying you can start painting your tree trunks...I placed 1/2 the trunk in shadow using some blue and brown mixed together. Add some dark scarring on the trunk...some fine lines..make them a bit concave to depict the roundness of the trunk. You can also add some splatter. I placed my trunk on the picture to get an idea of where I wanted some supplementary branches. Make sure you carry the branch into the trunk area marked off on your background...you don't want to have any gaps. When everything is dry you can remove the mask..add a little extra shading in the masked area if needed. Remove the tape around the edges. Now you are going to glue down your tissue textured tree trunks...say that fast 3 times!!! I'm using tacky glue but you could also use acrylic gel medium. Do Not Use A Glue Stick...it won't stay stuck. With the tacky glue I'm scraping it with an old plastic card to make sure I get it to the edges and only have a very thin layer. And then place some books to compress it flat while it is drying. That's it....I think it turned out pretty good...now I considering all the possibilities for this technique. At school I can easily see myself doing this with the kids..I might just change the background. Give it a go and I'll see you next time. Lovely, even better than the mountain. Lucky kids to have a teacher like you! Wow! It worked perfectly. Beautifully done. Thanx for the tute. What great colors. I love the sky and the texture of the aspens. So glad I found your blog. I'm an art docent at my kids' school for grades 5th and 7th this year. I've been doing it for 6 years and love it. I appreciate your index of grade-specific ideas. I love your site, thanks for all the great ideas and sharing them! I will be using some of them for after school art this year! Thanks so much everyone. I am really pleased with this piece. I framed it in a floating frame and it now graces the main floor. I'm loving the tissue paper texture technique. I can't wait to try it out this weekend! I'll be linking. Hello Gail! I love your blog, and all the tutorials and ideas! I'm about to move in a new flat where I will have a studio, so maybe at last I will be able to take on drawing and watercolour!!! Lovely work... all the best! Thanks again everyone...you spoil me with all your incredible comments. I try to keep up with them all and visit everyone's blog but sometimes I get very focused on a project..I appreciate your support. i love your blog. would love to have you on as a "helper" at one of my events. Just wonderful stuff. keep it up! Gail, thank you so very, very much for posting all these gorgeous art projects! I can't wait to try these with my 10-year-old daughter! One question: what is "mask"? Gail, I didn't get a chance to thank you for the presentation you gave at the ECEC in November. THANK YOU! You did an excellent job. I have a minor in Art Ed., so I to love learning new things about art. Out of all the presentations I attended (many by experience presenters), yours was by far the most worthwhile! You were very prepared and informative. I just wanted to let you know... obviously I was impressed, because I have never responded to a blog or even bothered to really look at one! Your blog is great...thanks again for the ideas!!! As a grade two teacher, I have been following your blog for awhile and I am always so impressed by your beautiful ideas. I also recently attended a watercolour workshop, and we made a similar project. One of the things our instructor did when we created aspens was to take a long piece of masking tape, rip it down the middle and then re-join the pieces so that the outsides were not so straight and even. Then we painted our scene on top, then ripped off the tape and continued painting lines with black like you have done. I hope that makes sense. Just thought another technique might be of interest to you!! Thanks again for your fantastic blog!! Hey Joanne: when I talk about mask I mean using masking fluid. For the trees in the distance I added a few lines of masking fluid on the white paper before painting, it acts as a resist. When the paint is dry you rub off the mask(it's similar to rubber cement but less smell) and you white lines are revealed. 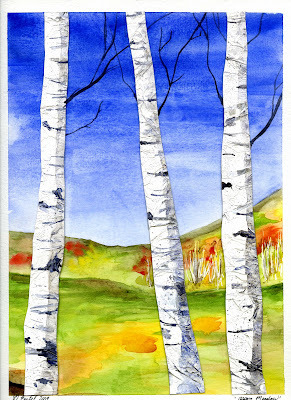 Thanks for posting the aspen tree painting. I love the idea! I can't wait to try it in my classes!